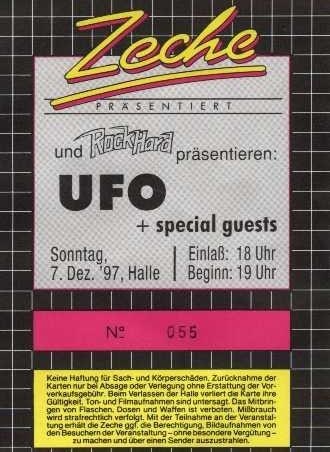 On December 7th, 1997 we could enjoy a repeat of the UFO concert in Noorderligt/Tilburg (Netherlands), but this time in Zeche/ Bochum (Germany). Here UFO, after a short trip through Finland, gave its first of a series of German concerts. For the second time in many years we would see UFO in the classic line-up. Danger Danger provided the supporting act. They succeeded in generating a good atmosphere through an excellent and inflaming show. 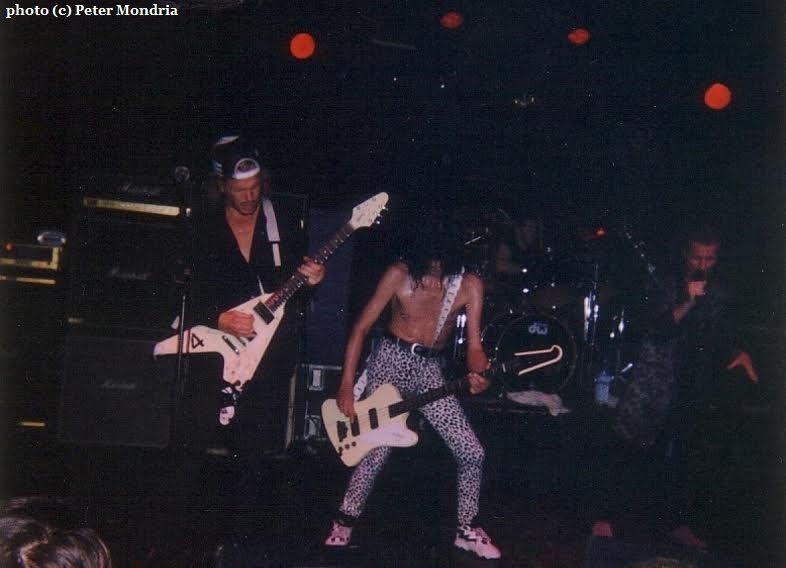 By now, we had managed to get to the front of the audience and, at about two meters from the stage, we could easily follow the performance of the men, especially that of Mr. Michael Schenker. 'Natural Thing' was the opening number. Michael stood, very characteristically, bent slightly forward, somewhat isolated from the rest. Pete ran and jumped like a spring lamb over the stage, responsible for the element of show and the base line (or was it the other way around?). Phil had lost none of his vocal qualities in all these years. 'Mother Mary', 'Self Made Man', 'Electric Phase', the choice of numbers was sublime. The intro to 'Love To Love' was fantastic to see. 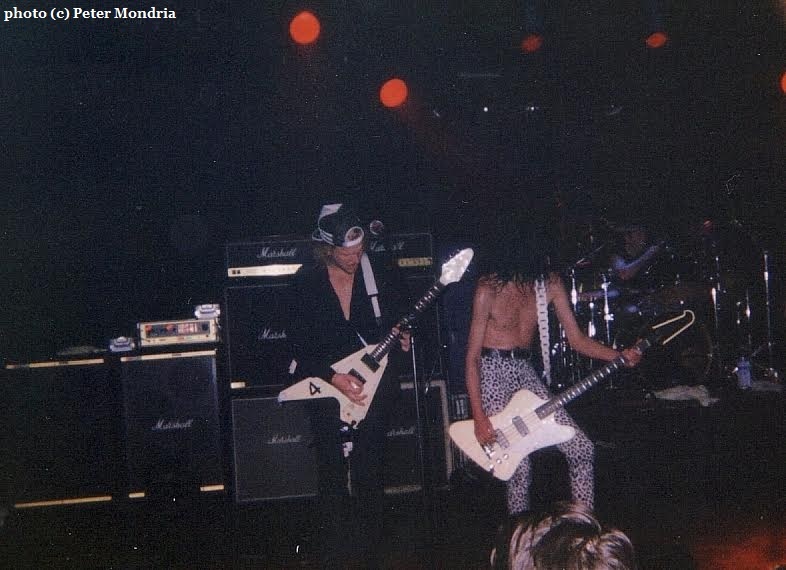 As a guitar playing unit Michael and Pete stood at the front of the stage moving synchronously, after which Michael went over into a short acoustical part. 'Too Hot To Handle', 'Only You Can Rock Me', 'Lights Out'.....UFO had touched down again. I managed to get the plectrum that Michael had nonchalantly flipped away. Afterwards we were given the chance to shake Michael's hand and to let him sign our "25th Anniversary" that we had purchased in Tilburg. We took the opportunity, after about 40 German rock enthusiasts had pushed in front, to express our appreciation of his musical qualities. It was the close of an evening in the present, but with an atmosphere straight out of the past.